I was hoping the Friday puzzle would improve my mood, but alas (or “OH, ME,” said no one ever), it really only made me cranky. For a 68-worder, I expect to see pretty smooth fill with a modicum of zippy stuff. The contrived ONE SOCK duplicating a word in the maybe-contrived HAVE ONE, uncommon BAILORS, crosswordese N-TESTS and ESSE, fairly dated SIPE, and lifeless H-BAR were the worst bits (along with that OHME). Oh! And MISLAYER. [Lousy floor contractor]? Give me a &%*$ break. And WII-ITIS has a rather 2007 vibe. ACE VENTURA is older than Wii, but I’m more sanguine about pop culture’s staying power even though I never did see any of the Ace Ventura movies. Lots of Scowl-o-Meter action here. Favorite fill: PIE A LA MODE (warm strawberry pie with dark chocolate ice cream sounds good, no? ), MULTIVERSE (which I’ll bet Brendan put into this grid long before the multiverse movie Spider-Man Into the Spider-Verse came along), Italian soccer club JUVENTUS (I hadn’t known that its name meant “youth,” but I always wanted it to), CARDI B, Norse SKALDS, and STAYS MAD (mainly because the Twitter use of “stay mad,” with or without hashtag format, is so good). 42a. [Easter Island statues], MOAI. Not to be confused with MAOI, a monoamine oxidase inhibitor. 22d. [Old World animals sometimes called toddy cats], CIVETS. Had never seen the term toddy cats before. Filing away for future trivia use. 48d. [Pacific island that’s also the name of part of the body], UVEA. A friend is currently recovering from uveitis, and I think this is the first real-world mention of the UVEA I’ve encountered (outside of medical dictionaries, websites, etc., and crossword puzzles). The island, which I’d never heard of, is part of the French territory Wallis & Futuna. Nobody invited the French to go there in the first place. 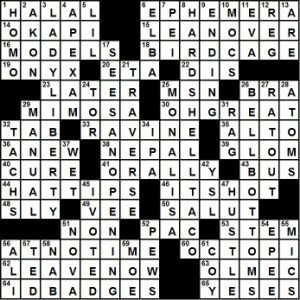 Robert W. Harris’s The Chronicle of Higher Education crossword, “Sky Boxes”–Judge Vic’s write-up. FULL MOON, CRESCENT MOON, NEW MOON, BLUE MOON. Fun stuff, as are the following: ARCADIA, CUISINE, SAND ART, IDEOLOGUE, ERIE CANAL, TAIWANESE. Good fill all around, excellent cluing, as always. One word I didn’t know, and I won’t criticize it, is IOLE. I see it was in a CHE puzzle a couple years ago and that Hercules loved her, so she can’t be all bad. I’d love to write more, but I need to pack up for Stamford! 26d [’70s fad that hints at the ends of 3-, 8- and 17-Down] BELL-BOTTOMS–This is hyphenated. I know that from research somewhere earlier in life. So, now we need to be mindful of the ends of three more entries. And … something to do with rung, probably a bell-related rung, rather than a ladder as suggested by the title. 3d [Historic torchbearer?] LADY LIBERTY–Okay, then. What are the ends of this? Or, for one answer, do I need to worry only about one end? L, Y? TY? BERTY? 8d [Crunchy Mexican dish] HARD-SHELL TACO–All right, what’s the end here? Or ends? CO, ACO? At this point, I got nothing, folks. OPENING BELL, TACO BELL, LIBERTY BELL ... And we’re just not going to talk about whether and to what extent this theme works, if at all, only because the theme answers are vertical. It is what it is, and it took me a long time to get it. YMMV. Let’s not overlook the value of the rest of the fill. OH GREAT! IT’S HOT! AT NO TIME LEAN OVER the BIRD CAGE. Just appreciate the EPHEMERA of the MONA LISA and the ID BADGES. And LEAVE NOW! Or, rather, right after HAT TIPS to the constructor and the editor. This is an easy cryptic, with many anagram clues that jump out at you because of unusual phrasing. For example, 11a. [Pelican heist goes wrong, resulting in brain disease (12)], ENCEPHALITIS—what the heck is a “pelican heist”? How would a heist gone wrong lead to neurological disease? And 20d. [Blended carb makes cranky person (4)], CRAB—what’s “blended carb”? Cryptics are trickiest when the surface sense reads more like a plausible sentence. The surface sense is less present in the non-anagram clues, too. E.g., 3a. [Oaf going around vault to reveal four-leaf clover, say (4,4)], GOOD OMEN, GOON around DOME. Can you envision an oaf going around a vault, and that vault perambulation somehow uncovering a clover? I cannot. The MAWKISH clue hinges on “Kim Shaw,” which is less effective than using a famous name like Meg Ryan (who famously anagrams to Germany). The best of the clues, perhaps, is 24a. [Big smile from red head captivated by alcoholic beverage (4)], GRIN. The “head” of the word red is the letter R, and it’s “captivated” within some GIN. You can easily envision a redhead (question for cryptic experts: could the one-word redhead serve as fodder for R, or does the head have to be a separate word?) beaming at a cocktail the bartender has placed before them. I need help understanding how we get from 15d. [Lacking luminance at both ends, gem miller fails to shine faintly (7)] to the answer, GLIMMER. Anyone? Always nice to see a more intricate theme in the LA Times puzzle. I got a whiff of the theme early, as I spidered down to ISLAMAB and realised something was likely going on with ADs. I thought the AD was going to be hidden in the central square initially, but was quickly put to rights. I also can’t be the only person who also mulled over ISFAHAN for that square since it is a (provincial) capital, but the geographical directions are wrong even if it is fairly proximate to Kabul. As it is, the ADs POPUP into adjacent down answers. The first two I found, ISLAMAB(AD) and ELIJAHMUHAMM(AD) had a Muslim subtheme going, but that doesn’t extend to STALINGR(AD), UNDERGR(AD) or STARKRAVINGM(AD). Despite the busy theme, we get plenty of action in the long downs: ABEVIGODA, SMARTALEC, DARKWEB (I’d quibble that it’s not limited access, since no-one is specifically denied access to it, the people using it are just difficult to trace, at least directly). BURNER is also a punchy answers, much beloved by the alphabet soup shows – NCIS, CSI etc. On the other hand, there are many inane short answers: WASI and APIN are bottom of the barrel partials for starters. This entry was posted in Daily Puzzles and tagged Brendan Emmett Quigley, Evan Kalish, Peter Koetters, Robert W. Harris, Stephanie Cerra. Bookmark the permalink. 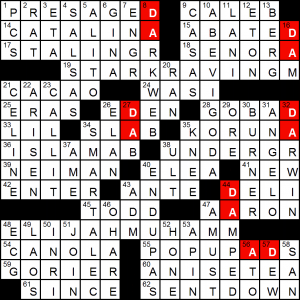 The NYT is a perfect example of why I have come to dislike BEQ’s puzzles generally. Silly words (BAILORS, MISLAYER) and obscure names galore. Not fun. I’ll second this. I rarely get much enjoyment from a BEQ puzzle, and this one was no exception. I have to disagree. 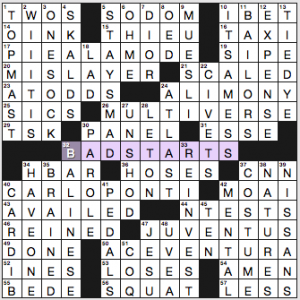 I didn’t have strong opinions either way about today’s puzzle, but there aren’t many constructors who are as productive and creative as Brendan — I’m always excited to see his byline. Although I struggle with all the names, I actually found some of the silly words (and their clues) quite entertaining. I think BEQ takes risks and it sometimes works better than others. Some people are highly successful by having a strong and predictable approach, and others by being a bit less predictable but more adventuresome. It’s really a difference in style. Since it’s so late (next day) I will second Huda as I agree with what she said so eloquently. I tried AHME before realizing it was OHME, not quite in the language-my only nit. Was surprised by how much I disliked this puzzle (too much trivia) but BEQ is one of the best puzzle makers out there, imo, and am grateful for his two free offerings a week. I’m generally a big fan of Brendan’s own Monday themeless puzzles. This one not so much. gem miller anagrams to glimmer if you lack the ends of luminance (the letters L and E). Now how about explaining AWFUL and OFFAL please? Where OFFAL’s clue has “12,” substitute “awful.” So [Announced awful entrails], say “awful” out loud and get a word meaning entrails. And [Terrible 16 on the radio (5)] is [Terrible offal on the radio], same deal. My questions: 7D, why the “(in French)?” Is M an abbreviation for mister in French but not acceptable in English? 9A: Isn’t the word “stands” extraneous? “Cab” works for taxi but I don’t think it does for taxi stands. 23A: “YA” is really an abbreviation for young adult? And yes, YA is absolutely a thing. A huge thing. Google it. And yes, M is the abbreviation for monsieur. Also for 7D, I get the OR + M part, but why take N from “name”? Other clues (1A, 4D, 24A, 17A) *told* you to take the first letter of a word and do something with it, but not this one. Maybe it was meant to read “usual *first* name, [rest of clue]”? 1A: “Tabby” = “Cat,” “returning” means flip it around to get “Tac” “first of October” = “O” –> TACO. Pretty simple. 3A: As Amy noted in the review – “Goon” going around “dome” to get GOOD OMEN. 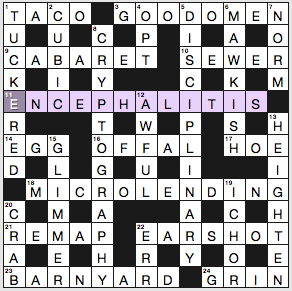 16A: This one was tricky. “Announced 12” refers to 12 Down. 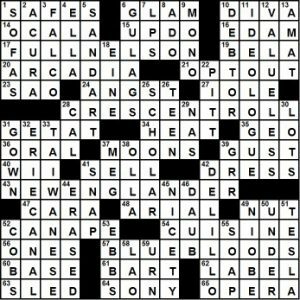 With a bit of circular logic and the hints “entrails” and “terrible,” you can deduce that OFFAL and AWFUL are the sound-alikes suggested by “announced” and “on the radio” in the clues. 17A: “Safety first” means the letter “s.” Take that from “shoe,” and you get HOE (a gardening tool). 5D: “Pricy island” is an anagram for DISCIPLINARY. Not sure how “I make stupidly” plays into it. In 9A, “Tear wildly” means an anagram of tear, in this case “aret” past the taxi (=cab), so cab+aret. My question is, why is the word stand in there? Cab = taxi but I don’t see cab = taxi stand. Tearing wildly past a taxi would be dangerous driving while tearing wildly past the taxi stand would merely carousing or running on the sidewalk? Maybe just part of the image rather than an essential part of the clue? I got nothing better than that. Here “stands for” means “means”. CABARET stands for nightclub. Any news on CRUCIVERB? We miss it…..
“Both the LA Times and I are now back online. The LA Times upload is a manual process at the moment and I was not able to take care of it. I will be looking at an automated solution so this does not happen again. Sorry for the inconvenience. LAT: I selected 4.5 stars when rating, but I guess I clicked “submit” a little too quickly and it went back to 3.0. Could that be changed? I really loved the puzzle. Thanks! Also: I don’t get 30D “Phone in crime shows” = BURNER. Maybe because I have never watched the shows that Gareth mentioned, I guess. A burner is a prepaid untraceable cellphone used in criminal activity. LAT – Unique for the LAT. Felt like a Thursday NYT puzzle. Great puzzle.